MSI will reveal a new Afterburner utility for Android devices at Computex, it will enable you to adjust and monitor your PC settings over a WiFi connection. The leading graphics card and mainboard manufacturer, MSI, today display the Android version of its popular Afterburner overclocking utility for graphics cards at Computex 2011. The pioneering Android overclocking utility was co-developed by MSI and well-known software programmer "Nick Connors". The new Afterburner utility allows the Android-based smartphones and tablets to adjust or monitor Afterburner settings on PC over a Wi-Fi connection. In addition to monitoring the temperature, voltage and fan speed, the utility can also be used for overclocking and overvoltaging! This year MSI is demonstrating how to use the Android-based cellphone to overclock the graphics card with the Afterburner app from booth L607 in the Nangang Exhibition Hall; giving enthusiasts a chance to experience for themselves the hottest overclocking technology app for tablets and phones. The Afterburner app enables Android phones and tablets to monitor or overclock a graphics card by connecting to the Afterburner utility* installed on a PC over a Wi-Fi connection. For enthusiasts who like to monitor the operation of their graphics cards, they can now do so through their mobile phone or tablet, even while playing the FPS games, without having to use a separate display. 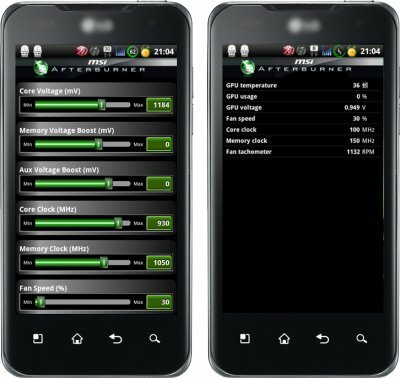 For extreme overclocking enthusiasts, they can use their mobile phone to monitor frequency, temperature and voltage parameters in real time while their computer is running full-screen testing software. Key parameters can even be adjusted on the fly for specific testing scenarios to make breaking world records in performance even easier. You can even connect to your home computer and check how the graphics card is running when you are away, a particularly convenient feature when running scientific computing programs that utilize the GPU such as Folding@Home. MSI will be demonstrating the Afterburner app of Android version at booth L607 in the Nangang Exhibition Hall at Computex 2011. Enthusiasts are welcome to visit the booth to experience for themselves the convenient, powerful, and complete monitoring functionality you have when overclocking with Afterburner using an Android phone or tablet PC. *Wi-Fi connection and Afterburner remote server must be available on the desktop PC to utilize Afterburner features.